Based on the surrounding environment, the time of the day, or the activity, one type of light might be more suitable than others. 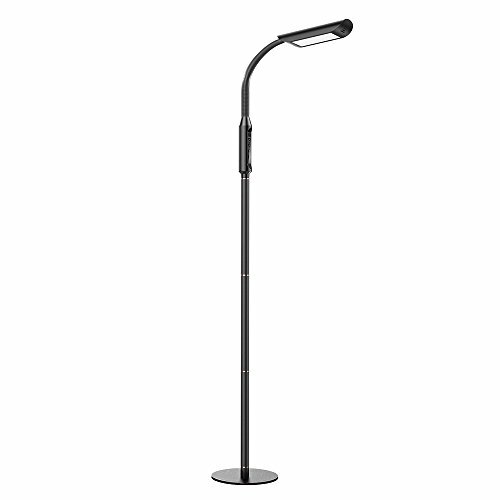 The VAVA LED Floor Lamp enables you to choose between 5 color temperatures and 5 brightness levels to mix and match for the most ideal lighting at all times. Absent of all unreliable mechanical button, the lamp is fully controlled via the built-in touch panel. This enables you to increase/decrease the brightness, choose the light color and even set a 1H timer by long pressing the ON / OFF button. Keeping the users in mind, VAVA has included a UL adapter that converts the voltage output to 12V/1.5A to prevent electrical hazards. Both when the lamp is being used as a floor torchiere or dissembled to perform as a desk lamp, the stable base will sit steadily and keep it from toppling over.